Vascular cognitive impairment (VCI) describes all forms of cognitive impairment caused by any type of cerebrovascular disease. Early identification of VCI is quite difficult due to the lack of both sensitive and specific biomarkers. Extensive damage to the white matter tracts, which connect the cortical and subcortical regions, has been shown in subcortical VCI (SVCI), the most common subtype of VCI that is caused by small vessel disease. Two specific MRI sequences, including diffusion tensor imaging (DTI) and functional MRI (fMRI), have emerged as useful tools for identifying subtle white matter changes and the intrinsic connectivity between distinct cortical regions. This review describes the advantages of these two modalities in SVCI research and the current DTI and fMRI findings on SVCI. Using DTI technique, a variety of studies found that white matter microstructural damages in the anterior and superior areas are more specific to SVCI. Similarly, functional brain abnormalities detected by fMRI have also been mainly shown in anterior brain areas in SVCI. The characteristic distribution of brain abnormalities in SVCI interrupts the prefrontal-subcortical loop that results in cognitive impairments in particular domains, which further confirms the ‘disconnection syndrome’ hypothesis. In addition, another MRI technique, arterial spin labelling (ASL), has been used to describe the disconnection patterns in a variety of conditions by measuring cerebral blood flow. The role of the ASL technique in SVCI research is also assessed. Finally, the review proposes the application of multimodality fusion in the investigation of SVCI pathogenesis. Vascular cognitive impairment (VCI) encompasses all forms of cognitive impairment that affect at least one cognitive domain and are caused by any type of vascular abnormality. These cognitive deficits range from the mildest form to fully developed dementia, including vascular dementia (VaD).1 Traditionally, VaD is the second most common type of dementia after Alzheimer’s disease (AD). VaD accounts for 15%–20% cases of dementia in Europe and America,2 3 and it is even more common than AD in Asia due to the high prevalence of stroke.4 5 Almost 15%–30% subjects develop dementia within 3 months after a stroke.6 The prevalence of VCI may even be much higher. However, the prevalence of VCI has been underestimated due to the lack of a consistent criterion for the diagnosis. The concept of VCI has gained increasing attention worldwide because most of the vascular risk factors, such as ischaemic heart disease, hypertension, obesity, smoking, diabetes, hyperlipidaemia and hyperhomocysteinaemia, are modifiable. Early identification of VCI is of great importance, since managing these risk factors in a timely manner may prevent disease development and reduce disease progression.7 However, the diagnosis of VCI still commonly depends on the clinical signs and symptoms and the exclusion of other aetiologies, which are usually insufficient to differentiate various dementias. Biomarkers that precede and predict the onset of VCI are in the early developmental stages in clinical research. Disrupted cortical–subcortical or cortical–cortical connections may result in ensuing cognitive impairments. Cognitive impairments in SVCI vary depending on the involvement of various brain areas. Generally, cognitive impairments in executive function, information processing and attention are relatively more common in SVCI.17 Deficits in these domains are associated with vascular lesions within frontosubcortical white matter and basal ganglia regions, which reflect impairments of the prefrontal-subcortical loop.8 18 Neuroimaging techniques are highly valuable for identifying diffuse white matter injuries and evaluating patients with SVCI. In general, MRI detects the white matter injuries more sensitively than cranial CT. MRI may detect impaired neurovascular function in the white matter that appears normal in CT.19 Two specific MRI sequences, diffusion tensor imaging (DTI) and functional MRI (fMRI) have been increasingly shown to detect early structural and functional brain alterations related to SVCI, especially in the last 2 years (figure 1). DTI and fMRI have emerged as useful tools for identifying subtle white matter changes and intrinsic connectivity between distinct cortical regions, respectively.20–22 A close link between DTI measurements and fMRI measurements has been confirmed by a series of studies.23–25 Combining DTI and fMRI findings may be highly valuable for the investigation of early and specific brain alterations in SVCI. Here, we review studies investigating structural and functional changes in SVCI using DTI or fMRI techniques (table 1). Furthermore, another MRI technique, arterial spin labelling (ASL), has been applied to measure cerebral blood flow (CBF) alterations in SVCI and will promisingly become an useful tool to detect the disconnection patterns in SVCI. We also discuss the role of the ASL technique in SVCI research and propose the application of multimodality fusion in the investigation of SVCI pathogenesis. 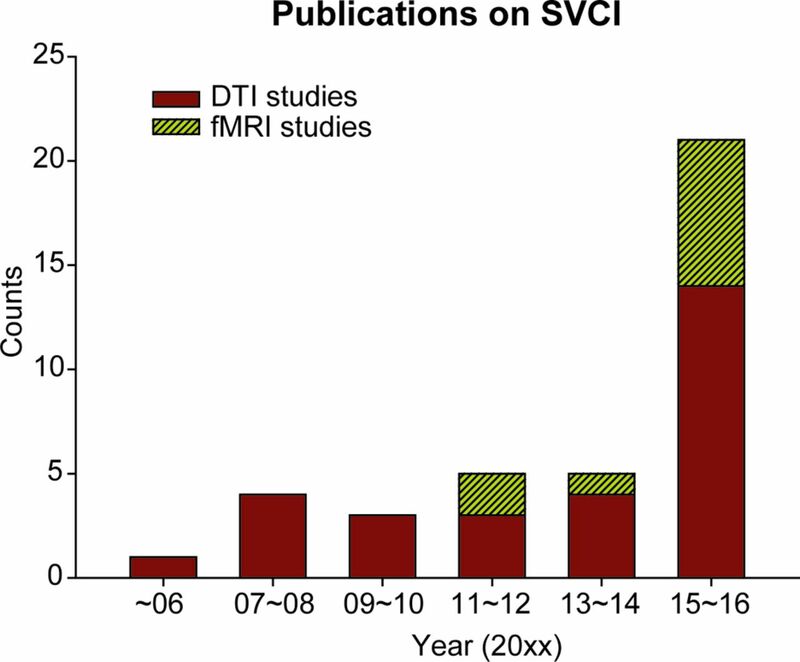 The number of publications on subcortical vascular cognitive impairment (SVCI) using diffusion tensor imaging (DTI) or functional MRI (fMRI) techniques. DTI and fMRI technique have been increasingly used to detect structural and functional brain alterations related to SVCI, especially in the last 2 years. White matter tracts consist of association fibres interconnecting cortical regions within each hemisphere (eg, superior/inferior longitudinal fasciculus, cingulum and uncinate fasciculus), projection fibres interconnecting cortical regions with subcortical regions, brain stem or spinal cord (eg, geniculocalcarine tracts, frontopontine tracts and thalamocortical tracts) and commissural fibres interconnecting brain regions between hemispheres (eg, anterior commissure and corpus callosum).26 These white matter tracts are vital for maintaining normal cortical–cortical and cortical–subcortical connections. DTI can potentially detect the microstructural integrity of white matter by measuring the directional water diffusion within tissues. Axon and myelin sheath membranes restrict the movement of water molecules in a single direction; water molecules can diffuse along the different directions of the axon but is obstructed orthogonally by the myelin sheath. Two common DTI-derived measurements, fractional anisotropy (FA) and mean diffusivity (MD), characterise the patterns of water diffusion within tissues. FA describes the anisotropy of diffusion, and MD reflects the average magnitude of diffusion in all directions.27 Thus, tract injuries are represented by a decreased FA and an increased MD. Several studies found that DTI measurements correlated with conventional structural measurements, including brain or lesions volume measured by T1 sequence and the intensity and volume of white matter hyperintensities measured by fluid attenuation inversion recovery sequence.28–30 Currently, DTI may be the most sensitive structural technique for assessing white matter microstructural damages due to cerebrovascular disease.31 DTI quantitatively measures microstructural changes in brain tissue that appears normal on other MRI sequences. For example, a longitudinal study investigated the alterations of DTI measurements and conventional structural MRI measurements in subjects with leukoaraiosis and lacunar stroke.20 The study demonstrated that DTI detected aberrant FA and MD at a 1-year follow-up, whereas no detectable changes were observed in other structural MRI measurements.20 Another study also found alterations in FA and MD in normal-appearing white matter in SVCI subjects. In addition, these alterations in FA and MD were associated with memory and attention-executive scores in the patients.32 Another advantage of DTI is that it displays a higher correlation with cognitive function than conventional structural MRI. Conventional structural MRI does not show a correlation between white matter lesions and cognitive impairments,33 and these white matter lesions are even common in the cognitively normal elderly population.34 35 In contrast, multiple associations between specific tract alterations and certain cognitive impairments have been demonstrated by DTI. A study explored the behavioural significance of DTI measurements in subjects with small vessel disease and found that DTI measurements (FA and MD) in the cingulum bundle correlated with verbal memory scores, while the MD value in the frontal lobe correlated with psychomotor speed performance.36 In addition, DTI measurements in the corpus callosum correlated with global cognitive function, executive function, psychomotor speed and concept shifting.36 This study suggested that DTI could serve as a useful tool to predict the cognitive consequences of small vessel disease. Another study of patients with SVCI also demonstrated that DTI abnormalities in supratentorial regions correlated with cognitive deficits better than the ischaemic burden detected by conventional structural MRI.37 These findings suggest that the white matter integrity measured by DTI correlates with cognitive deficits better than does the burden of the ischaemic lesions. The disconnection of specific white matter tracts connecting grey matter regions may contribute to the cognitive deficits in SVCI, which supports the ‘disconnection’ hypothesis. Therefore, DTI may serve as a sensitive tool to explore subtle white matter abnormalities and predict ensuing cognitive deficits in SVCI. In addition to its high sensitivity, DTI also detects specific distributions of DTI alterations in SVCI relative to other types of dementia. Compared with cognitively normal subjects, subjects with various stages of SVCI, including mild SVCI and subcortical VaD, displayed DTI abnormalities in almost all white matter regions.38–41 However, the DTI abnormalities in the anterior and superior subcortical regions are more specific to SVCI. A study investigated the microstructural alterations between SVCI and non-vascular mild cognitive impairment (MCI), an intermediate state between normal ageing and early AD. Compared with the non-vascular MCI subjects, SVCI subjects showed a greater decrease in FA in the centrum semiovale and parietal regions. In contrast, the non-vascular MCI subjects had the lowest FA in the hippocampus.42 A study compared the DTI changes between subcortical VaD and other types of dementia and found that subcortical VaD subjects had white matter abnormalities mainly in the frontal cortical regions, the genu of the corpus callosum and periventricular regions.43 Tractography analysis also suggested that the decreased FA in the transcallosal prefrontal tracts was the most significant biomarker for VaD.44 On the other hand, white matter damages in the temporal lobe and hippocampus, which are associated with episodic memory deficits, may be more specific for AD.45 Additionally, DTI changes in the frontal and temporal lobes seem to be more pronounced in frontotemporal dementia.43 The characteristic distribution of tract damages in SVCI interrupts the prefrontal-subcortical loop that results in cognitive impairments in executive function, information processing and attention,17 which further confirms the ‘disconnection syndrome’ hypothesis. Resting-state fMRI studies of SVCI have revealed specific distributions of FC alterations, mostly in the DMN that consists of bilateral posterior cingulate cortex, anterior cingulate cortex, inferior parietal lobule, medial prefrontal cortex, lateral temporal cortex and hippocampus formation.54 For example, the DMN FC with anterior cingulate cortex, frontal cortex and temporal cortex was decreased in patients with SVCI.55 The FC between the medial prefrontal cortex and the anterior cingulate cortex and between the thalamus and the orbitofrontal lobe were also decreased in patients with SVCI.56 A study comparing the DMN FC patterns between subcortical VaD and AD showed that the FC in the medial frontal and superior frontal gyri was prominently decreased in patients with subcortical VaD.57 A study of SVCI explored the low-frequency oscillation (LFO) amplitudes in the DMN and showed that the LFO amplitudes in the anterior portion of the DMN (eg, the medial prefrontal cortex) were decreased, while those in the posterior cingulate cortex were increased.58 Furthermore, the topological properties of FC were also investigated in patients with SVCI. Both disrupted intramodular connectivity in the prefrontal cortex, parietal cortex, anterior insula and middle cingulate cortex and increased intermodular connectivity in the parietal cortex were observed in patients with SVCI, and the latter finding was associated with impaired memory function in these patients.59 These resting-state fMRI studies support the major role of functional abnormalities in the anterior brain areas in SVCI. On the other hand, a handful of task fMRI studies have also shown similar distributions of regional activity alterations in SVCI subjects. Multiple brain regions are activated on task fMRI signals during performing a task.60 These regions form a particular network displaying similar task-related activities, and the disrupted network pattern suggests the disconnection of these regions in SVCI subjects. A Stroop test is commonly applied in task-fMRI studies to assess cortical attention and executive function and is usually associated with activations of the middle and inferior frontal gyrus, anterior cingulate, inferior parietal lobule and insular in healthy population.61 A task-fMRI study demonstrated that the activation in the frontal regions, parietal regions and anterior cingulate cortex, was markedly reduced in patients with VaD during a Stroop test performance compared with healthy controls. In addition, the reduced activation was related to the impaired performance in patients with VaD, suggesting that the disconnection of these regions may contribute to the cognitive deficits in these patients.62 Another task-fMRI study that used both patients with mild SVCI and patients with VaD found different activation patterns in the frontal cortex between the two groups during a Stroop task. The patients with mild SVCI displayed significantly increased activation, whereas the patients with VaD showed decreased activation, which the authors interpreted as a frontal compensation in the mild SVCI stage and a dysfunction in the VaD stage.63 The disrupted functional synchrony and regional activity shown in SVCI suggest that fMRI can detect functional changes caused by the ‘disconnection’, and these functional changes may reflect cognitive deficits in SVCI. Both DTI and fMRI can describe brain alterations related to the ‘disconnection’ in SVCI; DTI measures the structural changes in tracts connecting distinct brain regions, whereas fMRI measures synchronous activities of functionally related regions (figure 2). Notably, the structures with aberrant DTI changes largely coincided with the brain areas associated with abnormal FC changes in patients with SVCI. All these findings support the major role of the anterior part of the brain in the pathogenesis of SVCI. However, to the best of our knowledge, no study has directly compared or combined DTI changes and fMRI changes in SVCI. A recent study investigated the grey matter volume and FC of the thalamus and the medial prefrontal cortex in patients with SVCI. This study found decreased FC in both cortical and subcortical regions, which also displayed notable grey matter volume loss, and indicated that FC deficits may be partly due to grey volume reduction.56 However, the study did not assess changes in the white matter tracts, which are the most impaired areas in SVCI. Application of diffusion tensor imaging (DTI) and functional MRI (fMRI) in subcortical vascular cognitive impairment (SVCI). DTI measures the structural connections in SVCI, whereas fMRI measures the functional connections. Both DTI and fMRI are highly sensitive techniques and display high correlations with cognitive impairments in SVCI. 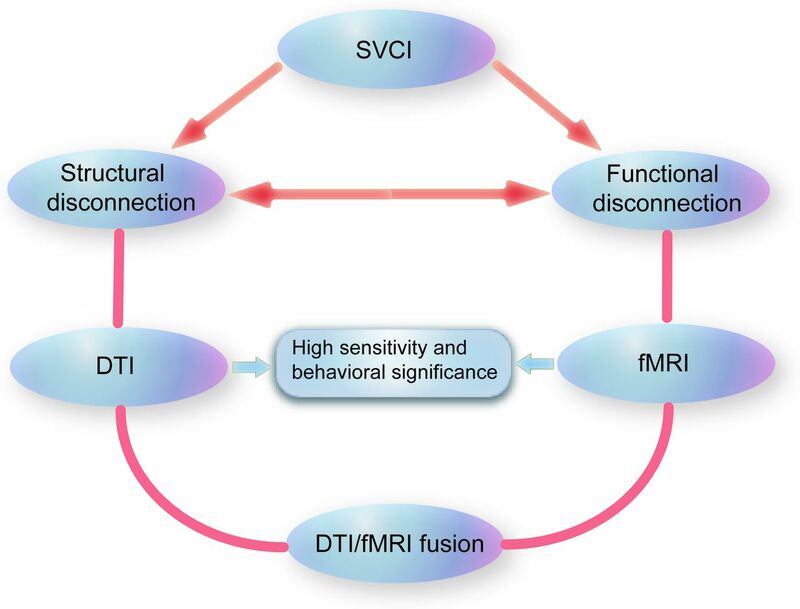 Due to the close link between brain structural connections and functional connections, the integration of DTI and fMRI techniques may further the investigation of SVCI pathogenesis. Given the intrinsic integration of the white matter and grey matter, multiple studies have consistently indicated that a close and complex link exists between the structure and the function of the brain. Brain regions exhibiting significant FC are also structurally connected in DTI anatomy; regions displaying stronger FC are also more strongly connected in structure.23 24 Intact white matter integrity plays a key role in the synchronous activity and neural activation of brain functional networks, and the patterns of functional networks also reflect the structural architecture of the brain. However, the patterns of FC do not simply equate to those of structural connectivity; the relationship is also highly complex. FC does not only rely on monosynaptic connections. Instead, polysynaptic pathway connections, bidirectional circuits and common-source connections may mediate FC.64 65 Nevertheless, this close and complex link between structure and function has received increasing interest and contributed to a better understanding of the intrinsic integration of neural resources. Given the close link between the structure and the function and the consistency in the distributions of brain abnormalities detected by DTI and fMRI in SVCI, it would not be surprising if the structural and functional properties covary across patients with SVCI. Fusing the DTI and fMRI modalities may provide new opportunities to deepen the understanding of disconnection syndromes. Actually, the combination of DTI and fMRI modalities has been applied by two studies to investigate structural and functional disconnection in alexia and AD.66 67 Alexia and AD are also considered as disconnection syndromes due to the disease patterns; a lesion caused by dysplasia, genetic factors or malnutrition (for alexia) or amyloid or tau pathology (for AD), results in a reduction in communications between brain regions that are vital to maintain normal cognitive function.11 68 Both studies showed that structural disconnection measured by DTI was associated with functional disconnection measured by fMRI, and both the structural and functional disconnections contributed to behavioural disturbance in the two conditions.66 67 The combination of DTI and fMRI modalities may be also of great value to the investigation of SVCI pathogenesis. First, DTI/fMRI fusion may contribute to the investigation of brain markers specific for SVCI. Combining DTI and fMRI measurements can reveal the entirety of the neurobiological pathways with both structural and functional abnormalities in SVCI. Second, DTI/fMRI fusion may be valuable for the identification of mixed dementia with both vascular pathology and AD pathology. Increasing evidence suggests that vascular pathology interacts with AD pathology (eg, amyloid beta pathology),69 and dementia exhibiting both pathologies is a common subtype of VCI.7 While AD pathology is measured by positron emission tomography (PET) imaging or cerebrospinal fluid analyses, vascular pathology may be undetectable when using conventional neuroimaging technique, as described above. The application of DTI/fMRI fusion may aid in the exploration of subtle structural and functional brain abnormalities, which are irrelevant to the AD pathology shown on PET imaging but associated with vascular pathology. Thus, the combination of DTI/fMRI fusion with measurements of AD pathology may be valuable for the identification of mixed pathological conditions. With the improved signal-to-noise ratio of modern high-field MRI systems, another MRI technique, ASL, has received an increasing interest in neurological disease within recent years. ASL measures CBF through the direct magnetic labelling of blood water as an ‘endogenous’ tracer at the tissue level.70 Several studies showed significant reductions in CBF mainly in frontal, parietal and temporal cortices in patients with SVCI using the ASL technique.71 72 The distribution of abnormal CBF coincides with that of DTI changes and FC changes in SVCI subjects. Reduced cerebral perfusion may result in neuronal and glial death, brain volume loss and impaired neuronal function.31 A study found that the reduced CBF in frontal cortex was associated with increased subcortical white matter lesions in patients with SVCI.71 Another study explored the relationship between CBF and cognition in patients with SVCI and showed that the reduced CBF in the frontal lobe, temporal lobe and several deep nuclei was associated with the degree of cognitive impairment in patients with SVCI.73 Notably, the CBF fluctuations of different brain areas may be concurrent, contributing to the concept of CBF connectivity based on CBF fluctuations.74 The functional networks identified using CBF connectivity display similar spatial patterns with networks based on BOLD signals, including DMN and executive control network.75 ASL has been applied to assess the CBF connectivity patterns in a variety of disorders, for example, schizophrenia, Parkinson’s disease and autism.76–78 Promisingly, ASL would also be used to detect the disconnection patterns in SVCI. Furthermore, a recent study found significant correlations between CBF and FC strength based on BOLD signals in multiple functional networks.79 The study suggested a combination of ASL and resting-state BOLD fMRI in the assessment of brain networks, since ASL providing reliable network-specific quantitative CBF measurements could be complementary to BOLD signals with a high temporal resolution. On the other hand, due to the low CBF level and delayed arterial arrival times in the white matter, the signal-to-noise ratio of the ASL image is remarkably low in the deep white matter,80 which may limit the application of the ASL technique in SVCI research. Nevertheless, ASL measures the CBF, which maintains neuronal structure and function. In the future, ASL may be combined with DTI and fMRI, which measure brain structural and functional alterations, in the investigation of SVCI pathogenesis. Several limitations of these techniques should also be emphasised. First, DTI and fMRI measurements are not highly specific to the type of pathogenesis. FA values in DTI are very sensitive to microstructural changes in the brain tissue but are not specific to the type of lesions. FA values are naturally decreased even in certain normal brain areas where nerve fibres cross.81 Functional alterations in fMRI also lack specificity. For example, the disrupted DMN has been shown in multiple disorders, including dementia, psychiatry, white matter disease, migraine and addiction.53 Second, neither DTI technique nor fMRI technique has an established standard in acquisition and analysis of imaging data. This may explain the inconsistent findings across studies.53 Third, these techniques, especially for fMRI, exhibit more variability than conventional neuroimaging techniques. FC is more frequently affected by multiple factors, including task demands, learning, prior experiences and consciousness.82 83 The findings are not stable enough even within studies and should be treated with caution. The mechanisms underlying the ‘disconnection’ in SVCI are far from well understood. Both DTI and fMRI techniques serve as highly sensitive modalities measuring structural and functional brain abnormalities in SVCI. The microstructural damages and functional abnormalities in the anterior portion of the brain are more specific for SVCI, which further confirms the ‘disconnection syndrome’ hypothesis. The close link between brain structure and function suggests that the integration of the DTI and fMRI modalities may be valuable for the investigation of SVCI pathogenesis.
. Incidence of dementia and major subtypes in Europe: a collaborative study of population-based cohorts. Neurologic Diseases in the Elderly Research Group. Neurology 2000;54:S10–15. Contributors QY was involved in the manuscript writing. FB was involved in the design, interpretation and writing of the review. Funding This work was supported by the National Natural Science Foundation of China (grant number 81671665), Jiangsu Provincial Key Medical Talents (grant number ZDRCA2016085) and the Natural Science Foundation of Jiangsu Province (grant number BK20160071).